We have an awesome prize to offer this week's winner! Did you know May has started designing stamps? Her very first set was released over at Neat & Tangled recently and we're giving it away as a prize! Check it out! 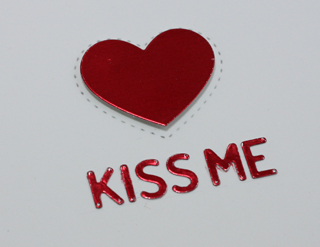 Nothing hotter than a red foil heart that has a complimentary foil Kiss Me sentiment. Fun new MFT Die-namics Tag Builder Blueprint 3. I am also submitting this card to the current Time Out Challenge #23! ...and I am submittingto Simon Says Monday Challenge, H is for...Heart ♥ in my case! So shiny!! 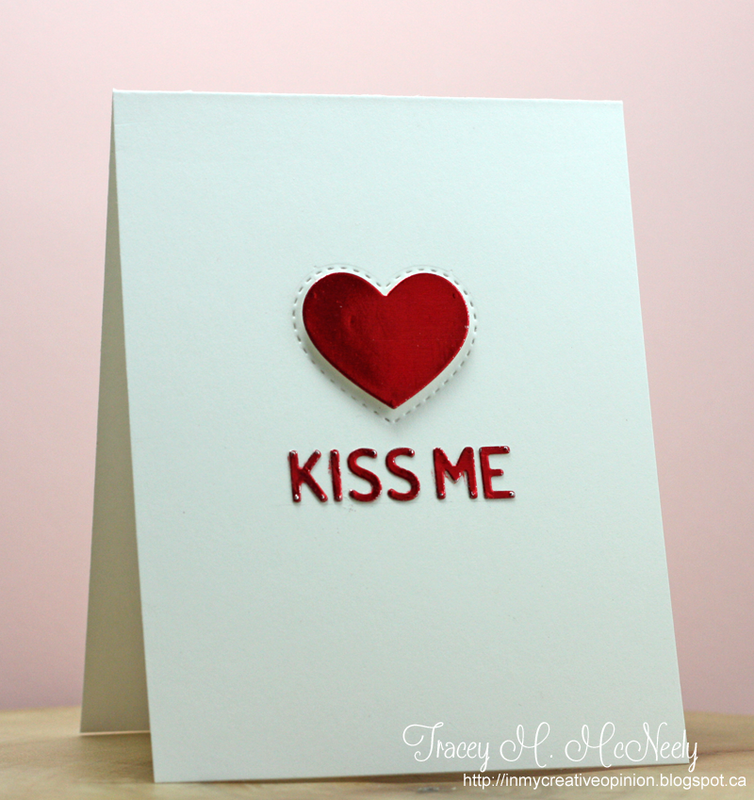 I love how you've bordered the heart with those sweet dots! A very nice CAS card. Love the stitching around the heart. It looks perfectly simple, but I bet those letters were tricky to line up! Well done! 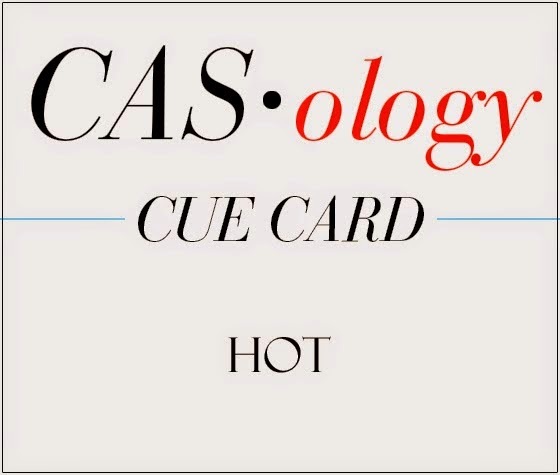 A totally hot card! That red foil certainly does pack a loving punch! Sensational! Ooookaaaay.. if you insist! !darling card!!! 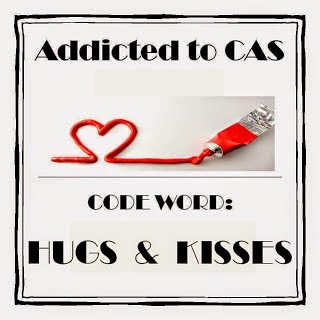 Love your CAS design and that you chose red foil for your heart and alphas! Definitely a 'Hot' card, Tracey...I love it! Thank you so much for playing along with us at Addicted to CAS, Tracey! This CAS card sure does make an impact. love it! Love your red hot heart. For your super hot hubbie, I assume? Wonderful CAS design. As always a perfectly CAS card with lots of pizzazz! So glad, Tracey, that you shared this with us at ATCAS! Adorable card...so HOT and so fun. Love the shiny paper you used too. Oh, I do love the effect of the red foil...dramatic, daring, fun! A perfect love card! The metallic look on this is AMAZING! MWAH! Another dazzling delight; another showcase of your incredible creativity! Simply stunning, and so perfectly stated! Amazing!!! I love the foil shine!!! oh, love this! Stunning CAS card! Thanks for sharing over at Addicted to CAS! Shiny foil - another thing for my shopping list! Love this especially the stitching around the heart. Great choice of material, Tracey ... the bold red foil is stunning!! Love it! CAS beauty Tracey! Saw this on your Instagram and fell in love with it - the CASness of it is amazing and you just do such clever work!! Hope you have a lovely day!! Just adorable. I think foil is going to be the new "it" product this year as I am seeing a lot of it. Love, love love the shiny heart!!! Sweet CAS design that shiny heart with the clean stitching is lovely! Thanks for playing along with us at Simon Says Stamp Monday Challenge! Very stylish CAS card! Thanks for taking TIME OUT and joining our challenge. We already have a new challenge running, it's a fun CASE challenge -I hope to see you playing along! Stunning design! Love the CAS-style! Thank you for taking the TIME OUT and join us! The metallic heart and sentiment looks terrific :) Thank you for sharing with ATCAS!